Affiliate marketing is an ever changing game. And as affiliate marketers we must constantly evolve alongside it. How then, do you stay relevant in a space that changes so rapidly? You must always be searching for knowledge. You must always be curious about the cutting-edge. You must always be willing to learn from leading influencers within the industry. There are a ton of general marketing blogs out there (think; social media and content marketing). What we need to learn from are the blogs and publications that offer actionable resources and tactics that drive real results for affiliate marketing professionals. With that said. Here are 25+ affiliate marketing blogs you should add to your reading list this year. Check out: Skip straight to the good stuff by starting with the Top Posts. Check out: The easiest way to navigate this site is by visiting the guide so you can narrow down to a specific topic of interest. Check out: Throughout the site you will find multiple eBooks, downloads, and guides all free if you sign up to his email newsletter. The ShoeMoney blog started as the lifestyle blog of Jeremy Schoemaker and now has numerous contributing writers adding posts on a regular basis. This blog covers most things internet marketing – from Search Engine Optimisation to email marketing. Check out: Jeremy’s inspiring story on how he ended up as an affiliate marketer. Check out: In addition to the post above, a great resource provided on this site is a free 7-day program to get started in affiliate marketing. You don’t even have to enter your email address. 1,000 real life, experienced based articles is pretty impressive. That’s what Zac Johnson has accumulated on his blog and what you can access just by visiting his site. His posts have a strong focus on adverts, as well as the sharing of new trends and resources to help grow your own company. Check out: the infographic on how top bloggers make money. It’s fairly simple but an interesting read nonetheless. Although there’s no new posts since July 2016, SugarRae’s blog still has some interesting content in past posts. You’ll find articles covering SEO, blogging, and of course, affiliate marketing. Check out: their glossary of affiliate marketing terms. Check out: his explanation of the difference between paid and free traffic affiliates – it’s an important distinction you need to understand. This article also gives a very real insight into the potential of affiliate marketing and what you actually need to put in. From the perspective of an affiliate marketing management company as opposed to affiliate marketers themselves, this blog offers a lot of the same content (trends, stats, product reviews) but from a different angle. There are often interviews or comments from well know industry managers which can provide you with insight into how they think and where they’re planning to move in the future – which all adds up to your advantage. Check out: the Affiliate Program Management section of the blog to get a really good look into the other side of the affiliate marketing world. Follows the life of Lynn Terry who’s a professional blogger, super affiliate, and full-time internet marketer, operating for more than 18 years. Her blog is full of marketing ideas, tips, and reviews aimed at helping her readers succeed in their online businesses. Check out: the Hot Topics section which is packed full of ‘how to’ guides – from becoming a professional blogger, to choosing your niche, and writing product reviews. Shawn Collins, the writer of this blog, is an industry expert and co-founder of one of the leading industry conferences for affiliate marketing – the affiliate summit. His blog has very regular updates and for those who prefer visual content, you can check out his affiliate tip TV channel on youtube. Check out: the course to Learn Affiliate Marketing where Shawn has laid out 12 chapters for you to work through. 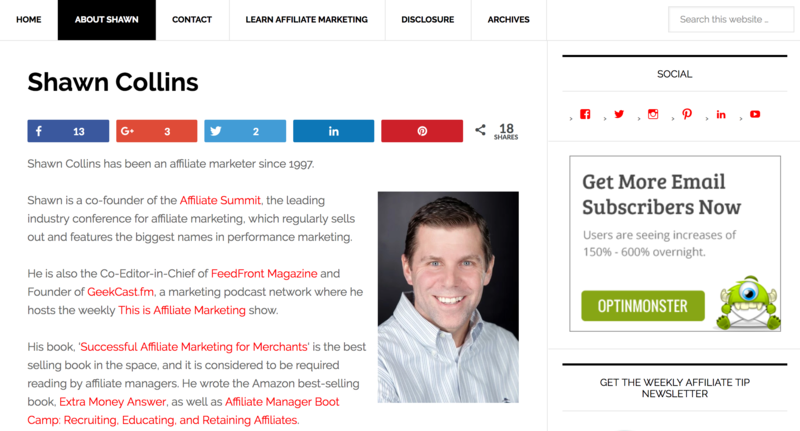 The other half of the co-founding duo who created Affiliate Summit back in 2003 – now a privately held, multi-million dollar media company that produces conferences, tradeshows, and a bunch of other content (FeedFront magazine and GeekCast.fm.) Missy Ward has a blog that covers a lot of general marketing advice as well as some personal insights. Check out: her free affiliate marketing materials which include quarterly issues of the affiliate marketing magazine FeedFront as well as all the internet marketing podcasts you could ever need at GeekCast. Providing content suitable for affiliates, bloggers, and SEO professionals in their daily marketing activities is what Adam Reimer’s blog excels at. He is another of the well-known industry figures who regularly speaks at Affiliate Summit, Pubcon, and Think Tank – amongst others. As well as being published in a variety of magazines and news sites. Check out: the blog for regular reviews on specific new affiliate programs that might suit your niche. Check out: their affiliate tools section – it’s ideal for those who are already established and looking for the next advantage. Newcomers could also gain some value by seeing another type of affiliate strategy/software that’s available. Founder of cashback site SunshineRewards.com, Tricia has been involved in the blogging and affiliate marketing industry for at least a decade and has the awards to prove her expertise. The articles on her site are easy to read and full of useful affiliate marketing information for all levels of reader. Check out: her recommended resources for further reading. Targeted at beginners, Ron Cripps site AffiliateXFiles is full of free content to help those starting out find their way around the affiliate marketing world. You can find information on all the basic matters – how to find niche markets and opportunities, how to optimize content, and how to find keywords that will convert. Check out: the complete set of info for new marketers. It’s in an easy to navigate page by page format. Check out: her free shirt Friday series which is a quirky idea to generate extra backlinks to her site whilst slipping a few affiliate links in front of her readers. This all-rounder in the affiliate marketing field offers advice and solutions for merchants, established affiliate marketers, and newbies. There’s plenty of content for those looking at getting started in affiliate marketing. Check out: the top resources for a list of all the software, platforms and items used by AffPlan. Even more interesting, take note of how each of these items is also an affiliate link, earning AffPlan income whenever someone purchases. Affiliate links really are everywhere! Check out: just take a look at their blog to get an idea of what promotions are available when you become an Amazon Associate. Check out: the free ebook Affiliate Marketing – the Smart Way for answers to a bunch of Pats most frequently asked questions. Matthew Woodward tackles the affiliate marketing industry from the blogging perspective and as such, you’ll find plenty of great articles to increase your affiliate activities through blogging. Like most of these blogs, you’ll find a bunch of interesting free resources to help you make tracks in the world of online marketing. Check out: the roundup of monthly income reports. This is probably the most exciting feature we’ve drawn your attention to across all these blogs. Every month, Matthew does a report on 15-20 different blogs and tracks their monthly revenue with a short write up about what’s been happening. It’s super interesting and covers an extremely broad range – from those losing $60 per month to one making $100,000! It’s incredibly inspiring for anyone interested in earning money online so make sure you really do check this one out. This affiliate marketing network itself has a blog, with a lot of focus on best practice and general industry news. A good alternative to the ‘how to’s’ and free guides put out by all the affiliate marketer blogs. Check out: their weekly roundup posts which are scattered through the blog. They feature a new merchant every week which could be a good opportunity to learn of a new product to promote. 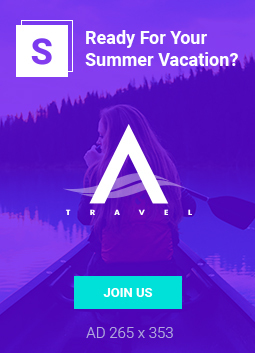 Another of the industry networks, ShareASale’s blog is similar to Avant Link in the sense that the articles are more focused on news and featured merchants. However, these guys also have some interesting post series (i.e. how to start a blog) and tip of the day guest posts. Check out: the affiliate section specifically so you don’t get confused reading merchant targeted posts! 24. What Does Joe Think? There are a lot of posts featuring ShareASale so we’re sensing some kind of relationship between the two however, Joe’s posts provide a lot of value nonetheless – with lists, actionable tasks and interesting insights. Check out: all his affiliate related posts can be found here. With content for both affiliates and merchants, Apogee has a blog that covers a broad spectrum. For the affiliates they mostly cover relevant industry news and highlight interesting merchants. Check out: their affiliate education for posts aimed at improving your online activities. This firm offers premium affiliate management services to retail and lead advertisers and have a very comprehensive blog. There are many categories to dig down in but the most interesting for affiliate marketers are the Affiliate Tips and International Affiliate Marketing. Check out: another section worth perusing is their Deals & Steals which highlights a bunch of great affiliate products to promote every couple of months. We thought: you’ve made it this far, why not throw in some bonus content as well?! In addition to the affiliate marketing blogs above, you can find a list of our favorite general marketing blogs below. These cover a range of topics from general purpose, to niche segments like email marketing. Each blog has what we consider it’s ‘speciality’ noted as well as a brief description and of course, our favorite component. Here’s a blog that has it all. This is a site created by marketers, for marketers, so unlike a lot of wide reaching sites, their content still holds plenty of niche value on specific topics. And boy do they cover a lot of topics. You can find the latest marketing tools, training, strategies, online seminars and discussion forums. Our favorite content: There is a 30-minute, weekly podcast where they host all sorts of different experts and conduct an in-depth interview in order to provide their listeners with real, actionable advice. Like a news site, but for the marketing world. And on steroids. Marketing Land offers readers with articles and news stories covering every aspect of digital marketing on a daily basis with regular guest post from experts in the field. Our favorite content: There is a huge library of whitepaper documents covering the entire digital marketing world. From their site you can also find webcasts and research reports. Ranked the largest business news website in the US Business Insider covers an array of topics including financial, media, and tech stories. Their advertising section has numerous daily updates with interesting articles to keep you on top of what’s happening in the marketing world. Our favorite content: This is Business Insider’s research branch where they produce an array of research into various topics. Findings are presented in a multitude of reports and newsletters to members of this premium service. If you’ve got lots of data and don’t know what to do with it then Kissmetrics is here to help. They are focussed on optimizing your marketing by testing, tracking, and analyzing your digital marketing. With lots of in depth blog posts, you’ll be stuck there for a few hours. These free guides provide beautiful and easy to read eBooks, infographics, and PDFs on general, email and social media marketing topics. This is a super clear explanation of what inbound marketing is and how it differs from the more traditional approaches. If you want to go further, they also offer a certification course which really teaches you the ropes. Digital marketing presence is the focus of those over at Impact, where they want to help you optimize your online profile. As a partner of Hubspot, they use the same methodology but with new ideas and through processes. Another large collection of visually appealing guides, books, and PDFs available to all. Heard of them? You should have. Ogilvy has been around since 1948 and is one of the eight largest advertising networks in the world. The Knowledge Bank, by Influence & Co, is a resource focused on helping companies create and distribute content that focuses on growing and educating a niche audience. Their blog covers a range of topics including thought leadership, content marketing, and social media. Free guides and templates for download from writing better content to getting published. Unique insights on just about everything can be found from Seth’s blog. A lot of it relates to marketing directly but even just reading any of his articles will help you write better content. Our favorite content: For Seth, it’s straight up. His blog is super interesting. If you look around his site he also has a bunch of free resources, books, and a couple of training courses. Conducting SEO research for over ten years would understandably make someone worth listening to. When looking to get a grip on your search ratings be sure to check out some of the resources offered on this blog. Co-founder Rand Fishkin (sporting a fantastic moustache) presents weekly videos on SEO marketing related content. Always fun and educational, these are worth checking out. If you’re after an event driven email marketing platform then Vero is where you should be looking. They offer everything you need from an email platform – automation, reporting, drip campaigns, split tests, and tracking event conversions. Vero have a handy ‘how to’ section of their blog dedicated to teaching readers ways of improving their email open rates and conversions. Great if you’ve realised writing an email and hitting send is not the end of the email marketing process! When you’re trying to scale your business through social media, making three posts per day to Facebook, Twitter and Instagram soon becomes a time consuming task. Enter HootSuite. With a platform allowing you to manage all your social media content in one place, they really can help you do more with your time. This is the place to find ideas and technology that could transform how we do business through social media.